What better way to celebrate America's Independence than by purchasing an American made product, especially one that features that stars and stripes. Give a salute to the California-based, Sbicca Americana Natural Wedge. 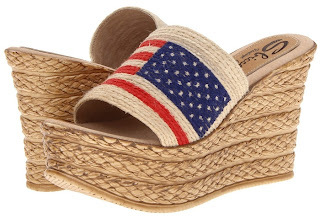 It features a slip-on silhouette, woven upper with American flag detail, and a 4" jute wrapped wedge heel with 2" platform. Celebrate America and show off your patriotism with every step you make this summer and it won't cost you an arm and a leg as they are $55.99 on www.6pm.com.